I finally got around to working on the aircraft to support the modern Japanese fleet I built for playing Shipwreck! The ships are 1/3000th scale but the aircraft are 1/1200th scale, purchased from Magister Militum. Magister Militum have two ranges of aircraft, Cap Aero and 617 squadron.with the Cap Aero slightly finer models than 617 Squadron.Having said that, both ranges produce some nice aircraft. The two ranges cover modern aircraft from the major powers. The aircraft are modelled with wheels.down, I guess as they would have made a good addition to 1/1200 or 1/1250 scale carriers or models of an airfield. I snipped the undercarriage off in most cases as part of the clean up process. 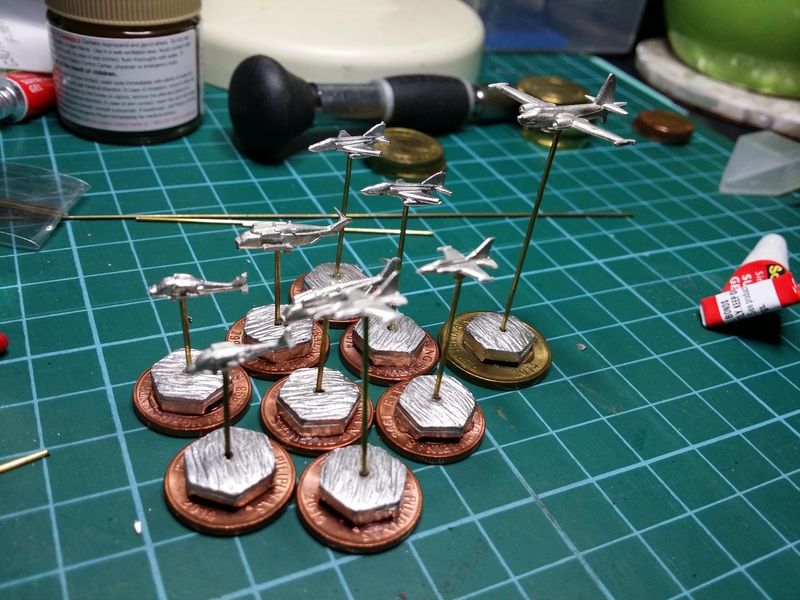 I had some hexagonal bases from Magister Militum as well but I found when mounting larger aircraft they were a little unstable. Enter the Philippine Central Bank The 10 and 25 centavo coins, apart from being magnetic, provide an extra degree of stability. There are no Japanese Aircraft but fortunately the Japanese companies work with US aircraft manufacturers to produce localised versions. So, the McDonald Douglas F-16 is produced locally in Japan by Mitsubishi with a slightly larger planform (about 25% larger) but to all intents and purposes is an F-16. So, the F-16 doubles as a Mitsubishi F-2. The Japanese also use F-4 Phantoms so I get to have one of my favourite aircraft on the table. The Kawasaki Company made a local version of the Neptune so the model is filling in for a Kawasaki P-2J Neptune. The last two aircraft are some helicopters. The Sikorsky Super Stallion, a heavy lifting ‘copter and another MItsubishi local production of an American ‘copter, the Mitsubishi SH-60J Seahawk. The brass rods these are mounted on are at various heights. 4cm is used for maritime patrol aircraft like the Neptune, 3cm for attack aircraft like the F-2 and 2cm for helicopters. 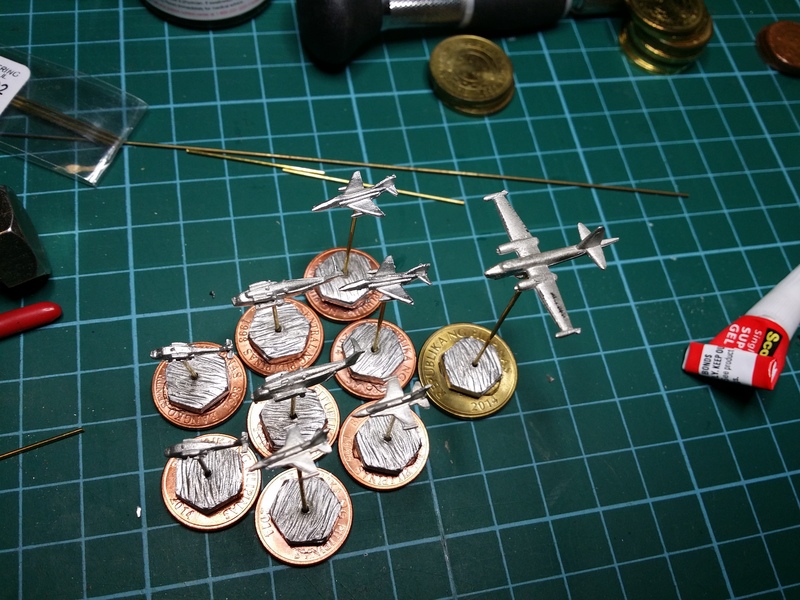 I have plans to mount some missiles on a 1cm base but that may need to wait until after I have a sanity check. I’m looking forward to getting some paint on these on Sunday. Don’t forget that the Japanese also use F-15s and E-2s and have ordered the F-35. Indeed KH … Shapeways’ postage is famous or its rapaciousness. the stuff you’ve got there looks really neat though and I was severely tempted woth the Il-28 if for no other reason that it was an early model kit I made.